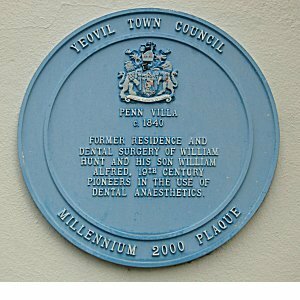 William Hunt senior, who lived and worked in Penn Villa, was for many years the only residing dentist between Exeter and Salisbury. He is celebrated with a millennium blue plaque affixed to Penn Villa. He was born in Wincanton on 24 September 1811, the son of William Hunt. In the 1841 census, as a single 25-year old dentist, he was living in Hendford with a domestic servant. In the winter of 1841 he married Mary Elizabeth Mayo (1822-1852) at Yeovil. She was the daughter of George Mayo (1788-1852) and Jane née Randall, and together William and Mary had four children; Sarah Alice (1842-1931), William Alfred (1845-1929), Mary Christiana Prankard (1849-1939) and Elizabeth Ada Mayo (b1852). Mary died in 1852 and in the autumn of 1854 at Shaftesbury he married Mary Neave (1814-1891) of Gillingham. They had a daughter, Frances Emma (1855-1926). William Hunt first used ether as a dental anaesthetic for painless extractions at Christmas 1847 in Penn Villa, a year after its first European use by London surgeon James Robinson. William was a Freemason, initiated into the Lodge of Brotherly Love in Yeovil in 1875. In the 1881 census he was listed as a Dental Surgeon of the Royal College of Surgeons and was living at Penn Villa with his wife Mary, son William listed as a Practicing Dental Surgeon, two daughters and three domestic servants. In the 1891 census he and Mary, both aged 79, were listed as living in Penn Villa with four of the children, including William junior then aged 45, a cook and two domestic servants as well as two trained nurses of the dental practice. By this time William gave his occupation as a Qualified and Registered Dentist (Retired). William Hunt senior died in 1905, aged 93, in Penn Villa.